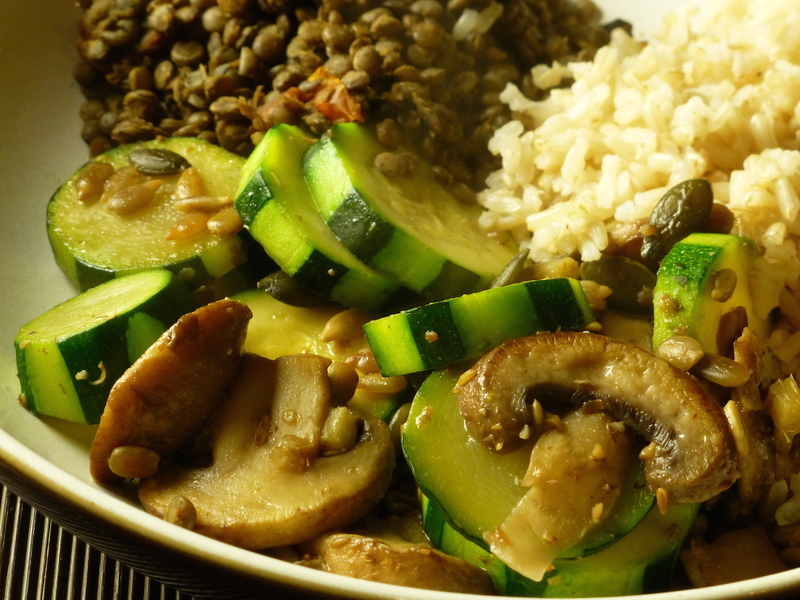 Courgettes and mushrooms with Puy lentils and brown rice • Quick & Tasty - Get Cooking! Puy lentils have a great rich, earthy taste, and combined with dried tomatoes and porcini mushrooms they are delicious. Courgettes and mushrooms stir fried with sunflower seeds and ginger are another great combination. This recipe takes a little bit longer because the lentils and brown rice take about 30 minutes to cook, and it can take some time until the courgettes are ready too. Put the lentils, dried tomatoes and porcini mushrooms in a microwave pot with a teaspoon of ground cumin and 2 1/2 cups water (2 cups water for 1 cup lentils, another 1/2 cup for the dried tomatoes & porcini mushrooms). Stir; cook for 10 minutes on 50%. Meanwhile, wash and slice the fresh mushrooms and wash, peel and slice the courgettes. Heat the oil and fry the ginger, coriander and sunflower seeds for a few minutes over low heat. Add the fresh mushrooms, stir-fry over high heat until they start to release their liquid. I put the courgettes in the microwave for 2 minutes at full power (900W) before adding them to the pan. If you can’t do this, you just have to let them simmer in the pan until the are soft enough (not too soft, they should still have some bite).